Five years ago, our city was devastated by a storm more dangerous than anything we’d ever seen. Fueled by worsening climate change and rising global temperatures, Superstorm Sandy took the lives of 43 New Yorkers. New York’s subway systems flooded, homes were destroyed, and hundreds of thousands lost power. By the time Sandy passed, it had left tens of thousands of families homeless and had cost New Yorkers $42 billion in damage, which our communities are still paying for today. The worst damage was borne by our city’s most vulnerable: people of color, low-income people, and the elderly. Today, these extreme weather conditions are only getting worse. In the past few weeks, we have seen Hurricane Harvey tear through Texas and Louisiana with unprecedented rainfall and flooding, Hurricane Irma, the strongest storm ever recorded in the Atlantic, has devastated Florida and the Caribbean, and Hurricane Maria has decimate Puerto Rico. With climate disasters threatening communities around the country and world, and with the federal government run by a climate denying POTUS & Cabinet, bought and paid for by fossil fuel billionaires, people are rightfully afraid. But we are not powerless! 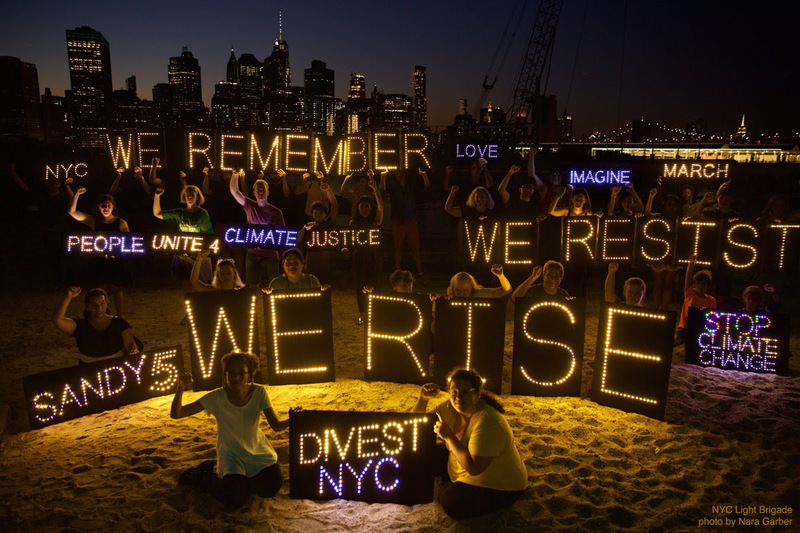 Five years after Sandy, and three years after the historic Climate March in NYC in 2014, New Yorkers will take to the streets again to keep the pressure on corporations and politicians to take action on climate. We need everyone to join this effort! On Saturday, October 28th, we will assemble at Cadman Plaza, Brooklyn at 11am and march over the Brooklyn Bridge, and then rally at the Smith NYCHA Houses, which were heavily affected by Hurricane Sandy. New Yorkers will come together to remember the lives lost and the damage incurred from Sandy. And we will make clear demands of New York’s elected officials to recognize the urgency of the climate crisis and take effective action to secure the future for our families.